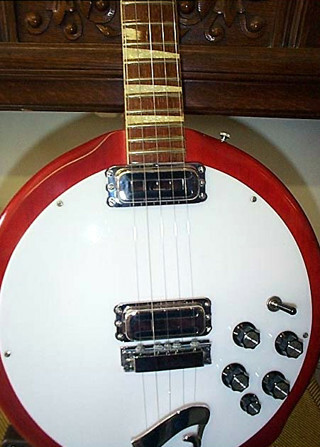 Rickenbacker introduced the Bantar in the summer of 1966. The Bantar was an electric five string banjo with two pickups Four string versions were available on a special order basis. Available with Deluxe (see these photos) or Standard features. Fireglo or Mapleglo finish. "Half five string and half the sound of an electric guitar" says the company literature. A note in the Rickenbacker Byrds file says that Roger McGuinn used a Bantar originally given to Bob Dylan.